Life is a balance of happy and sad, good and bad. The balance is essential for so many reasons and the best one I can think of is, how do you know how happy you are if you have never experienced sad. Nobody wants sadness in their lives but everybody knows life is not perfect and no matter how happy or rich or famous or lucky or blessed one is, an element of sadness is always in the mix. Because that is what life is all about. You have not lived a full life until you have experienced both extremes of emotions. Yesterday I found joy in sharing my new friend Rocky with all my friends here and on Facebook. He has been my "happy" the last couple of weeks and I look forward to the next time I take him for a walk, he just makes me so happy!! Today I was whizzing through all the posts on my facebook page and came across probably the saddest thing I've seen for a long time. It felt even sadder than the recent tragic event that happened in Christchurch New Zealand. I dont know how one rates what is sadder, it's not something tangible but it is something that you can feel in your heart. But it is a sadness that also sends a message of hope that people will see and feel the emotion and they will take it to their hearts and be more responsible for their actions. As sad as it is, I found it also very beautiful which feels almost inappropriate. Do you think this is beautiful? Or what emotion do you feel when you look at it? Have a terrific week my friends!! It represents a lot of sadness because a person losing a beloved child is way up on the sad meter. Beautiful Windancer...............Drink/Driving - a total curse..............Mike..
it certainly is a curse Mike, and it destroys lives every single day. 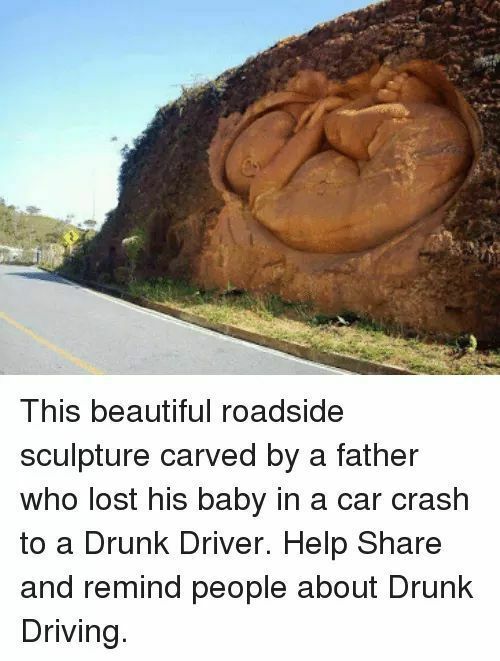 Because of the reason for this carving, I see sadness. The loss of a baby not even born to experience the wonder of life. Yes that is so sad - heartbreaking. How anyone can get into a car and drive under the influence of alcohol is beyond me. Yet drivers will still drink or drive after taking drugs and now we also have the selfish ones who wipe out lives while TEXTING on their phones. I just hope they don't drive past trying to take a picture on their phones rather than concentrate on the road. I viewed the picture for a good 2 minutes or so before scrolling down to read the accompanying text underneath, and during that time I couldn't figure out why you found it so sad. Just looked odd to me, especially considering the size of the breasts on what was apparently supposed to represent a fully formed fetus. I wondered if it were an anti-abortion artwork, indicating that every time a woman aborts, there's a 50% chance she's aborting a fellow female? When I scrolled down a bit and saw what it *was* meant to represent, I felt a pang of sorrow for anyone who has lost a loved one to a drunk driver, but came away feeling it could have been expressed more clearly, so it wouldn't need an explanation via text. I am not trying to be 'stroppy'...just giving you an honest impression. Delete if you'd like.